Kalicharan shot to the top of my watch-right-now list when Ashwin Pande, trusted advisor in such matters, told me that I had overlooked it in my recent list of my favorite villain lairs at the Wall Street Journal India Real Time blog. Once I investigated the film's provenance, I realized he was probably quite right to bring it to my attention. 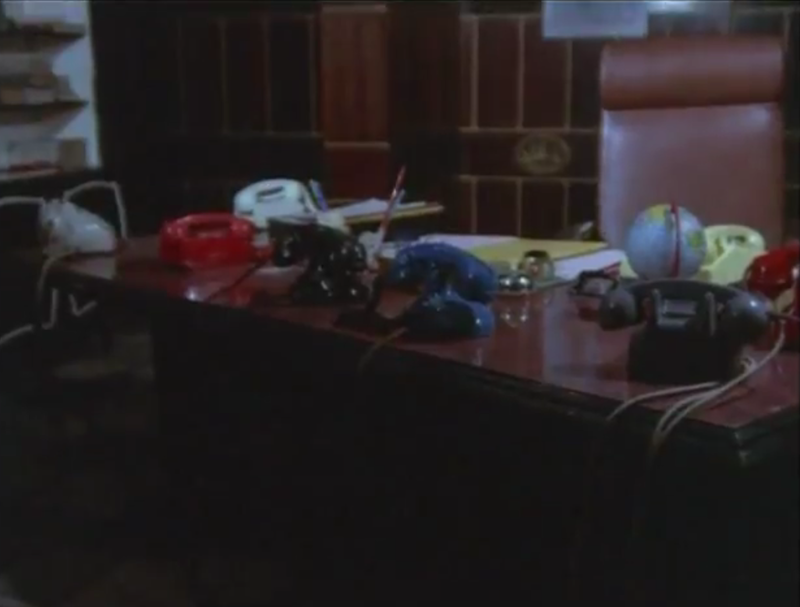 Subash Ghai's directorial debut and 1976 vintage and Reena Roy and a criminal mastermind named LION suggested that, indeed, something special might be lurking in its midst. a canpoy bed, a clear glass holding-cell sort of chamber, an escape hatch that drops into a barn full of livestock, and beep-booping machines that, as Ashwin said, do nothing but beep-boop? Yes. Extremely. Obviously. I have a vague memory of reading somewhere that "Shotgun" Sinha got his nickname because of his line delivery. Even if that isn't true, it certainly could be, if this film is anything to go by. 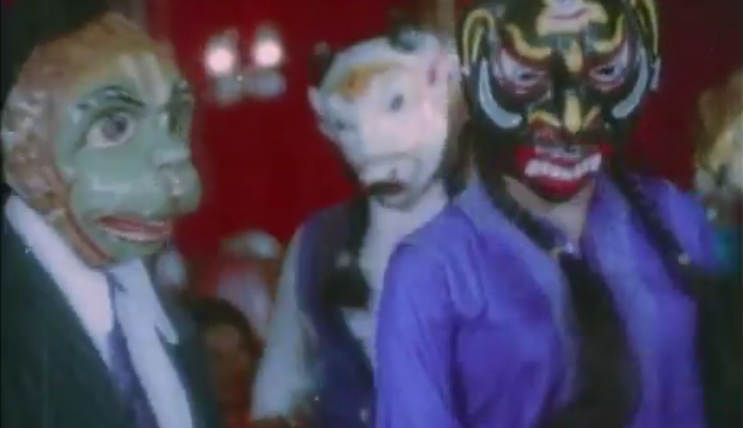 To get a sense of what he does here, think of the barkiest dog you've ever heard from a neighbor's yard at 5 in the morning, then scale that sound to human bass voice with its effect amplified by the very presence and nature of a swaggering, mustachioed 70s Indian film star. It is so unpleasant to listen to. 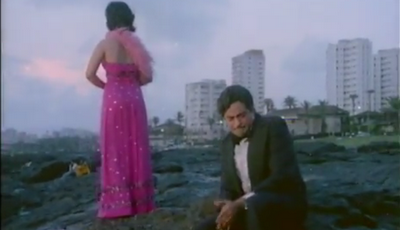 I tend to be a Shatrughan apologist, but I cannot defend his style here (or Ghai letting him indulge in it). Which is really too bad, because it's a fun role. Without giving too much a way, this film came out two years before Don but has a significant plot point in common in a way that gives Shatrughan a sort of triple role, but he dampens the fun of that by shouting in every character. Unrelated, but also very distracting, is the geisha/zombie makeup he wears throughout much of his time in his second character. Not to mention the wig, which I think has a life of its own. Do not look directly at it. Do not disturb its slumber. 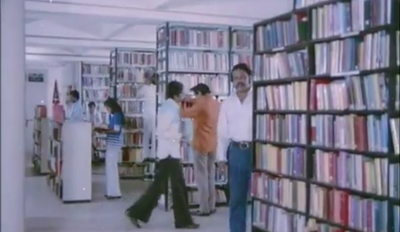 Otherwise, Kalicharan is the kind of masala I tend to like very much. There is little notable about it, really, but it is also perfectly enjoyable in the way the 70s films about criminal masterminds, police officers, and spunky love interests tend to be. It's another film that exemplifies what has come to be my favorite thing about Hindi cinema, which is that it creates a world in which we simultaneously know exactly what is going to happen and have no idea what to expect, accepting almost any variation of the unfolding and revealing of typical plot elements within certain values and parameters. For example, we know the good guy will figure out who the bad guy is, but did we suspect the aha moment would come at a New Year's Eve party at a swanky hotel as someone gazes at spinning illuminated decorations? No, we did not, but neither are we completely surprised to learn these things. All things are possible except for the great immutables. As long as certain requirements are met—e.g. there will be an item number, quite possibly with Helen—anything else is up for grabs—her backing dancers will be both mariachis and Santa Claus, and the audience will wear creepy masks. Don has something else to answer for! 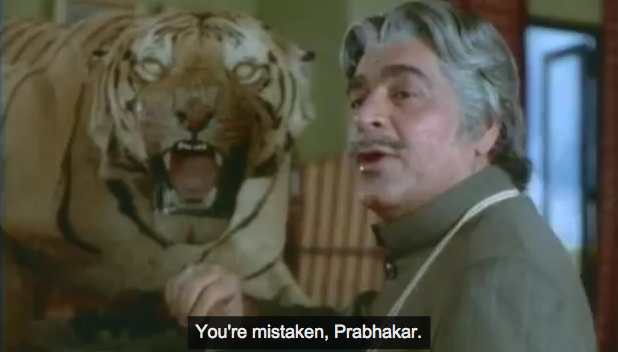 Prem Nath, as Shatrughan's boss, manages to be even more irritating every time he speaks than Shatrughan is, and his character is somehow a complete idiot yet not really played for laughs. Ajit does the villain thing we've all seen him do a million times, though the scene where he catches a mole among his gang in a lie is delicious. 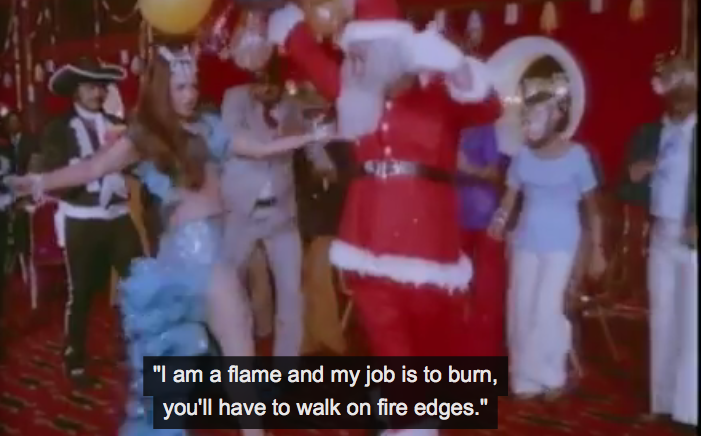 Reena Roy is underused, but she swears a lot (at least according to the subtitles) and gets to don a disguise, carry a knife in her knee-high boots, and punch a baddie in the warehouse brawl. She also has a song that reminds me quite a bit of "Choli Ke Peeche" (but given the space-time continuum, that should be the other way around, of course) and includes a nice little snowfall. and a cape worn over a dress with white lacy collar and cuffs. 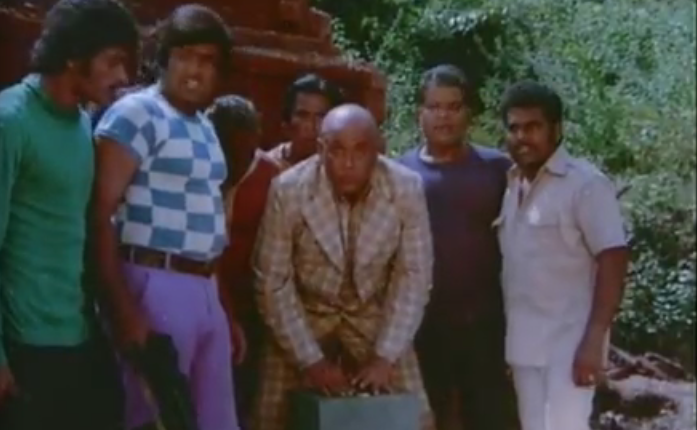 Prem Nath: "The wardrobe department hates me." Alka: "I think my jumpsuit is printed with cars." Reena: "Cape, black gloves, and riding crop FTW!" Adding distinctive notes to this particular masala: Shetty and company set up bombs that don't explode. But mostly I wanted to show you that shirt. Maybe it's totally normal to have three hood ornaments, but I'd sure never noticed it before. There are several views of a library. 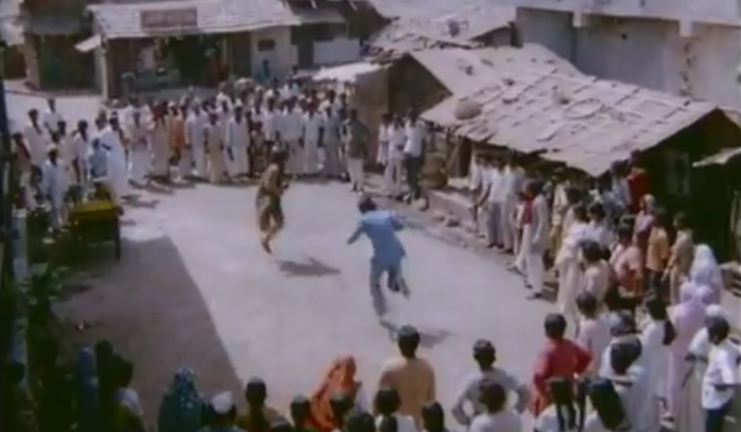 And best of all, Shatrugan fights Danny Dengzonpa with a trishul. 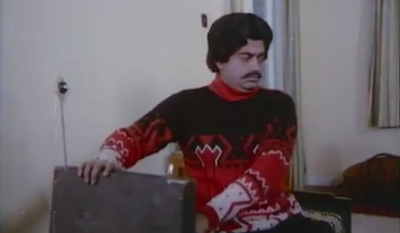 Danny's character has only one functional leg, so Shatrughan, honorable guy that he is, ties a scarf around one knee so that his foot is kept off the ground. It's probably the most Monty Python-esque moment I have seen yet in Bollywood, a sort of mix of Silly Walks and the Black Knight. Surely this is not meant to be funny, but equally surely it is hilarious. 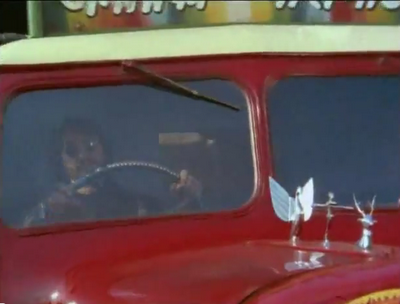 If you're in the right mood, Kalicharan will do you a masala solid. Find out for yourself: Rajshri has put it online for free with subtitles here! * Maybe resident physicist Filmi Geek can express this as a formula? One of the awesome movie made in Bollywood.... Superb action, superb acting and fantastic direction. Beth , the influence of LOIN as Ajit pronounces it , cant be overstated. Some years (6 to be precise) ago , a North Indian was giving a presentation on some topic and he concluded the Powerpoint Slide by putting up a slide that said "before the end of the day the LOIN in Africa will go hungry or the LOIN will eat the antelope".